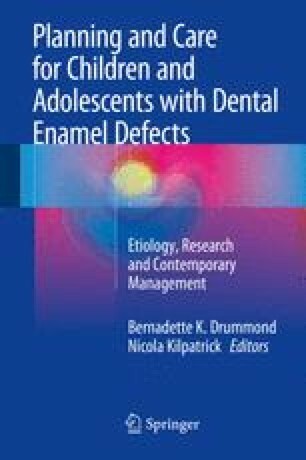 When children present with teeth with developmental defects of enamel (DDE), achieving long-term successful outcomes for the teeth is dependent on establishing a diagnosis of the problems and on immediate, short- and longer-term treatment planning. Good records (medical and dental history as well as clinical radiographic, photographic, and histologic examination) that are available for successive clinicians who treat the child are also important. It is also important to consider referral for medical evaluation if it is thought the defects are related to a general systemic or genetic condition that has not been investigated. This chapter provides guidance on the process of examination required to establish a diagnosis and possible treatment options including the impact on the developing occlusion when those options may involve extractions.